The HP Officejet 4360 is a versatile all-in-one printer with wireless networking capability that performs important tasks like printing, copying, scanning and sending faxes at quick speed. The printer is also able to provide printouts from smartphone, computer and tablet. The speed with which it manages printing is about 22 pages per minute in black and white and 17 pages per minute in colour. It has a high level of compatibility with the HP Officejet 4360 ink cartridges, which boosts its efficiency and performance. Further, the HP Officejet 4630 printer has a built-in 2" screen, an 80-sheet paper tray and is driven by 64MB DDR1 memory. It is also programmed to facilitate scanning directly to a mobile device with HP Printer Control. Automatic duplexing for two-sided documents is another function this printer performs. It works with 802.11b/g/n wireless and USB 2.0 connectivity and is able to print in resolutions up to 1200 x 600 rendered dpi up to 4800 x 1200 optimized dpi colour. To reduce the costs while using this printer, components like HP Officejet 4360 ink cartridges are easy to install in it. Other functions that the HP Officejet 4630 printer perform include creating superior quality borderless photos and laser-sharp documents. In addition to that, it also does easy wireless printing using HP ePrint, Apple AirPrint and HP wireless direct. Finally, the dimensions of this printer are 7.4 x 17.6 x 13.1 inches and it weighs approximately 7.5 kg. The HP Officejet 4360 printer is packed with an impressive range of features and functions that helps in performing important tasks with ease. Though it can be a little expensive and a bit slow in carrying out some important tasks, its output is consistently good. How to align the HP Officejet 4360 ink cartridges from the Printer Software? Step 1: Load a letter or A4 unused plain white paper into the input tray. Step 2: Open the printer software. Step 3: Click Print, Scan & Fax, and then click Maintain Your Printer. Step 4: Printer Toolbar appears and Click on align ink cartridges tab. The product prints an alignment sheet. Step 5: Load the cartridge alignment sheet on the right front corner of the glass. Even after aligning the printheads, the print quality does not improve, try replacing the cartridges with the new HP Officejet 4360 Ink Cartridges that will probably help to resolve the issue. How to replace the old or dried out ink cartridges and install the new HP Officejet 4360 Ink Cartridges? Step 1: Make sure the power of the printer is turned on. Place new cartridge in slot at an angle under the opened tab, and then squeeze the tab closed as the cartridge slides into place. Close the cartridge door properly. Step 4: Align the cartridges. 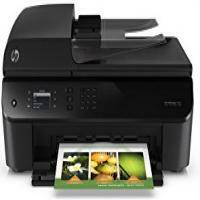 Q. I’m planning to purchase HP Deskjet F2290 printer as I can use compatible HP Officejet 4360 ink cartridges in them. I’d like to know your opinion if combining printer and components of different models is ok and give good results. A. Please rest assured that you will get the same top quality results even when you print with different model number of printer and cartridges that are given by the company, which they do only after they’ve ascertained the results of the combinations. You can purchase the HP Deskjet F2290 printer and install your extra cartridges in them. Q. Does HP Officejet 4360 printer print wirelessly? Also, is it easy to install ink cartridges in this printer without any hassle? A. The HP Officejet 4360 prints wirelessly when connected to HP ePrint, Apple AirPrint and HP wireless direct. It is easy and a hassle-free task to install cartridges in this printer. Q. I would like to place the order for a 3-pack HP Officejet 4360 ink cartridges (2 black and one colour) as it suits my printing requirements the most. I’d like to know if you have this package in your stock and can deliver in 1-2 days whenever I need it. Thanks. A. We will be happy to execute your order for HP Officejet 4360 ink cartridges and can deliver it in one-two days if factors like transportation and other things are favourable and also if your cartridges are available (which they usually are) at that particular point of time. However, you may give us a phone call and let us know your requirement in case of urgency and place your order before 12.00 noon (Monday to Friday) so we can provide you with the exact status of the availability of the cartridges and gear up once you confirm the order. Q. Do HP Officejet 4360 printers support wireless printing? A. Yes, HP Officejet 4360 printers come with Wi-Fi support, enabling them to wirelessly print from your mobile devices or computers. Make sure that your device is connected to the same network as your printer. Q. Should I expect any downgrade in print quality using your compatible HP Officejet 4360 ink cartridges? A. Absolutely not! Our compatible HP Officejet 4360 ink cartridges are of high quality, that are FSC tested and certified. They are manufactured to work well with your printer and you will not find any difference in quality between our compatible ink cartridges and the original ink cartridges. Q. What type of paper can I use with HP Officejet 4360 printers? A. You can use plain paper, envelopes, cards, photo paper (5 x 7 in, 4 x 6 in, 8.5 x 11 in) to print on with HP Officejet 4360 printers. Q. How do I check the ink levels of HP Officejet 4360 ink cartridges on my Windows 8 computer? Open HP Utility from the "Heward-Packard" folder. Select the HP Officejet 4360 series from the list of devices located at the left of the window. The ink levels of the ink cartridges will appear on screen. You will receive a low ink warning when the ink levels are low. Keep a replacement of the ink cartridge ready. You will only have to replace the ink cartridge when the print quality becomes unacceptable. Q. Where can this printer ideally be used? A. The HP Officejet 4360 printer is an all-in-one machine with scanning, faxing and copying functionalities making it a great choice office use. It also comes with Wi-Fi support and can produce high quality printouts. It is a compact and lightweight printer making it suitable for home use also. Q. How many pages can HP Officejet 4360 ink cartridges print without being replaced? A. Original HP Officejet 4360 black ink cartridges can print up to 190 pages and colour ink cartridges can print up to 165 pages. Whereas, our compatible HP Officejet 4360 black ink cartridge can produce 475 pages and colour ink cartridges can produce 415 pages without having to be replaced. You can also save money on HP Officejet 4360 ink cartridges by buying them in multipacks. Q. How do I connect my printer to my Wi-Fi network? Press the "Wireless" button on the printer control panel, and select "Settings". Choose "Wireless Setup Wizard" and click "OK"
Follow the instructions prompted on screen to setup the wireless connection. Insert the printer software CD in your computer. Follow the on screen instructions to install the printer driver. The printer is now ready to print via Wi-Fi. Q. What is the maximum print resolution that HP Officejet 4360 printers are capable of printing? A. HP Officejet 4360 printers can print up to a resolution of 4800 x 1200 dpi for coloured printouts and 600 x 1200 dpi for black printouts. Q. How do I print a booklet with my HP Officejet 4360 printer using a Mac computer? Open the document you want to print, and click on "Print". Check the "Two Sided Printing" selection box in the print settings. Select "Paper Handling" and choose the "Odd Only" option in the "Page to print" selection. Select the "Automatic" option in the "Page Order" Menu and click "Print". When the pages are printed, remove any unprinted page from the input tray. Remove the printed pages from the output tray, align them, flip them over such that the printed side is facing down and load them into the printer with the top edge down. Return to the print menu and select "Even Only" option in the "Pages to Print" selection. Q. What is your return policy on faulty items? A. All our products are warranted to be free from any defects. In the event that a faulty product is delivered to you, simply contact us on 048 308332211 or email us on info@printerinkcartridges.ie within 30 days of receiving your product. We will arrange a replacement or refund for you.